This week’s contributing blogger, Lia Kramer, is a third-year graduate student at the Institute of Fine Arts’ Conservation Center at New York University pursuing an MS in the Conservation of Historic and Artistic Works and an MA in the History of Art and Archaeology. She will complete her fourth year of study as an intern with Tate Modern’s time-based media conservation department. The second session of day 1 featured presentations that aimed to describe the current landscape of time-based media (TBM) art conservation education beyond the academic institutions included in session 1. The group of speakers represented established TBM conservation labs and university education programs in allied fields. All spoke to the challenges faced and accomplishments reached in developmental practice and education. 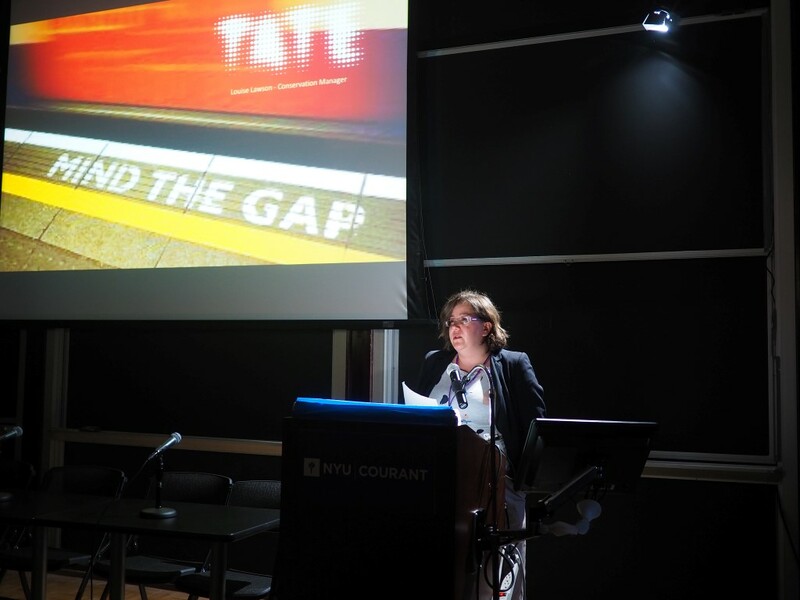 Louise Lawson, Conservation Manager of Sculpture & Time-Based Media at Tate, described the museum’s approach to ongoing staff development and collaborative working, as well as Tate’s commitment to education through traineeships. 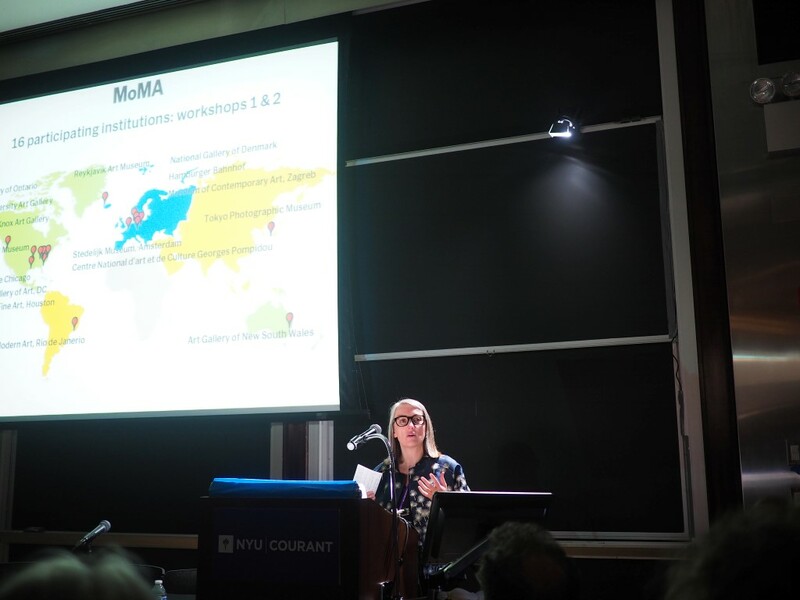 Deena Engel, Clinical Professor, and Director, Program in Digital Humanities and Social Science in the Department of Computer Science of the Courant Institute of Mathematical Sciences at NYU presented the work she performed with Joanna Phillips, Senior Conservator of Time-Based Media at the Solomon R. Guggenheim Museum, regarding the benefits of creating collaborative working relationships with allied professionals and computer science students. This partnership is supported by the Guggenheim’s Conserving Computer-Based Art initiative, ongoing since 2014. Briana Feston-Brunet, Variable and Time-Based Media Conservator at the Hirshhorn Museum and Sculpture Garden, highlighted the importance of cross-departmental interest and efforts in developing protocols for acquisition and care of TBM artworks. Martina Haidvogl, Associate Media Conservator at SFMOMA, echoed the importance of cross-departmental collaboration, which has proven to be continually successful since the inception of “Team Media” in 1996. 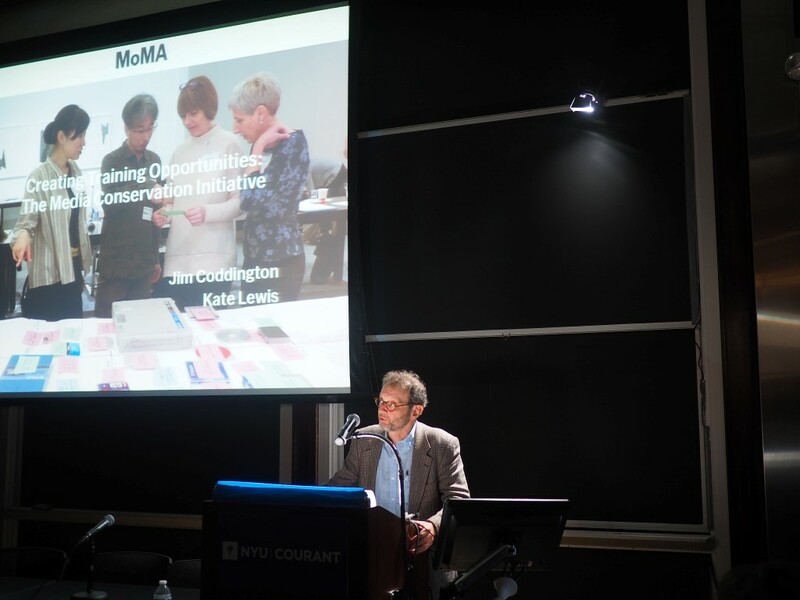 Jonathan Farbowitz, Fellow in the Conservation of Computer-Based Art at the Solomon R. Guggenheim Museum, and Peter Oleksik, Associate Media Conservator at MOMA, spoke on their experiences entering the conservation field with training from NYU’s Moving Image Archiving and Preservation program. The session continued with a presentation from Jim Coddington, Conservator, and Kate Lewis, Agnes Gund Chief Conservator at MoMA, which illuminated their efforts in furthering TBM conservation training at the professional level through the Media Conservation Initiative, which comprises a series of workshops, fellowships, and expert meetings spanning four years. These workshops encourage collaborative discussion amongst museum staff by bringing curators and collection managers to the table. Glenn Wharton, Clinical Professor in Museum Studies at NYU, shared his experience in providing a voice for conservation within the Museum Studies graduate education, with a focus on critical thinking to encourage awareness. Andreas Weisser, TBM Conservator at the Doerner Institute and Consultant for Analog and Digital Preservation at restaumedia, presented his process in creating TBM protocols for the Doerner Institute. His talk underscored the challenges faced by institutions that wish to care for their collections but may not have the resources to support full time TBM conservation staff. A common thread throughout the session was the emphasis on collaboration, whether internally within an institution or in consultations with specialists or contract conservators. Challenges echoed by many of the speakers included finding financial support and motivating allied professionals to support conservation efforts. Where these obstacles have been cleared, speakers reported successful results pushing forward media conservation not only within individual institutions, but also for the broader scope of the field. The presentations and discussions considered the current landscape of TBM preservation with a mind to the wider perspective of perception of the field, and underlined the importance of advocacy and outreach to produce greater shared interests as a catalyst for action. As practical training continues to develop for students and active professionals, these topics and experiences provide a valuable platform for progressing methodologies. On a personal note, this session described realities of working as a time-based media professional, which served as a reminder of our role not only as conservators but advocates for the very work we do.